On Sunday, Aug 12, Managing Editor Emily Willingham, Chemistry Editor Adrienne Roehrich, and Contributor Raychelle Burks spoke on bringing science to you. Here’s a summary of our panel. Photo by Ryan Roehrich and used with permission. 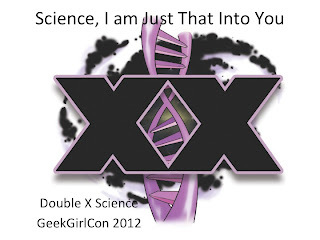 We started with a welcome and gratitude to the organizers and attendees and our tagline "Science, I am Just That Into You." We were selected to appear with a lot of fantastic programming over the weekend. 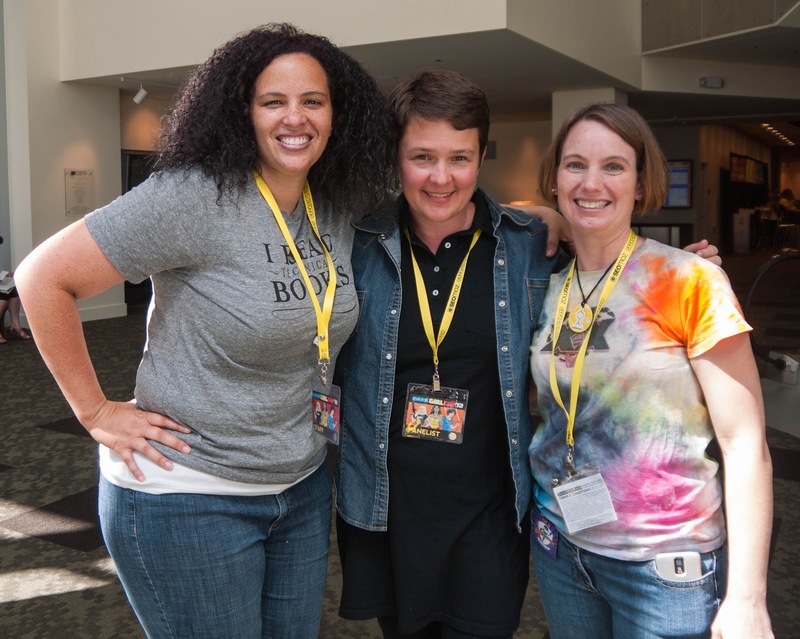 All 3 have PhDs in their respective fields – Emily is a developmental biologist, Ray is an analytical chemist, and Adrienne is a physical chemist. Emily and Ray are prolific writers. You can find their articles all over the internet and in print. 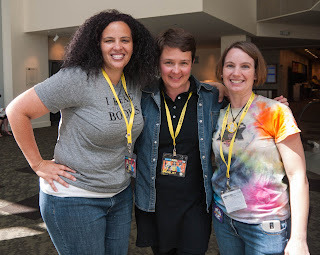 Ray is a staff member for GeekGirlCon and Adrienne is a Special Agent volunteer. All 3 are active on social media and welcome live-tweeting and suggest the #DXS hashtag along with the #GGC12. 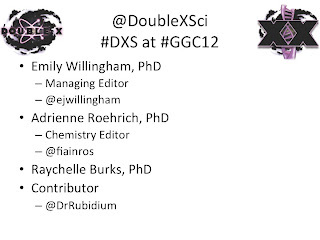 And you can use the @DoubleXSci for the panel. Then a poll of the room to see who had heard of the site. 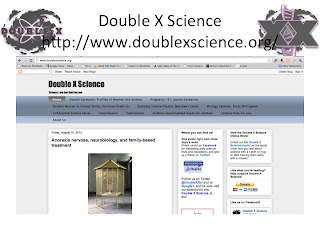 Only a few attendees were already familiar with the site, so we told them that DoubleXScience covers a lot of current science. 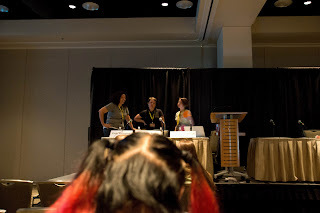 For example on (the previous) Monday, Emily posted about the Mars Curiosity Rover touchdown. In July, the physics editor covered the Higgs particle announcement. We also cover timeless, yet updated science, such as pregnancy and other health issues that we editors perceive to be of interest to ourselves and our readers. 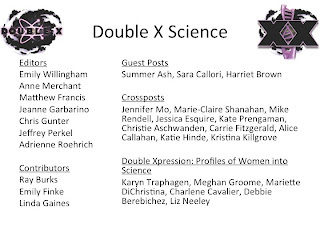 It’s hard to discuss what Double X Science is without discussing who it is. 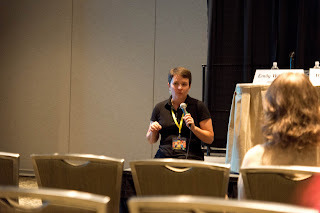 In November of 2011, Emily founded Double X Science, Emily what was your motivation in founding the site and what was then and is now your vision for it? As mentioned, we have content from editors, other sites and contributors. Ray was the first contributor to the site – what attracted you to Double X Science? What do the attendees want to know? Photo by Adrienne Roehrich and used with permission.